Huang Shan is is the Chinese name of the 72 peak mountain range known as the Yellow Mountains. They are found in the Anhui province in south eastern China. For the Chinese, Huang Shan, along with Guilin is probably the country's most famous natural attraction. 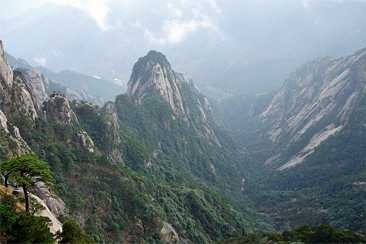 The three tallest and best-known peaks are Lotus Peak (Lian Hua Feng, 1,864 m), Bright Summit Peak (Guang Ming Ding, 1,840 m), and Celestial Peak (Tian Du Feng, 1,829 m). Luckily for us nowadays there are 2 cable car routes that take you a good part of the way up. There are miles & miles of stone steps and pathways, some of them are very steep, or cling precariously to the side of the rock face. 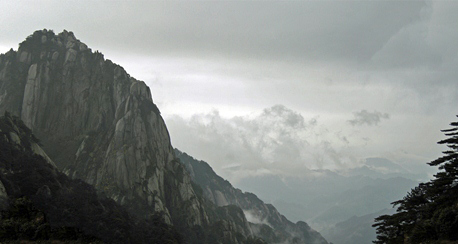 Huang Shan is known for its sunrises, pine trees, which grow in the most precarious places, some of which seem to adopt personalities, strangely jutting granite peaks that can resemble animals or birds, and views of clouds clinging to the mountainsides for more than 200 days out of the year. 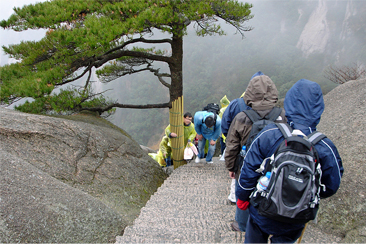 There are two walking routes, the Western Steps, and the Eastern steps. 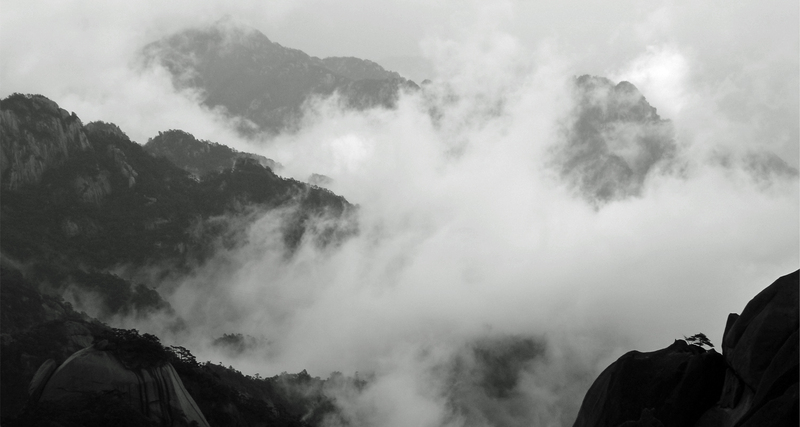 On the first day, on the easier Eastern Steps, the weather was wet, and the clouds hung heavily around the peaks. Occasionally the clouds would part, and you would be given a spectacular view. 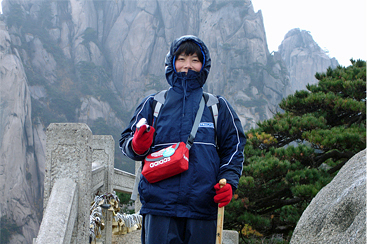 Most of your stay is at a height of more than 1,500 meters, so warm clothing is essential, and you have to carry your own clothes and belongings with you. 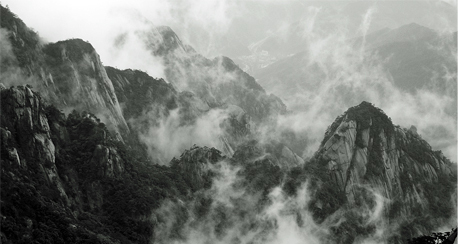 For me the attraction was to find the views that inspired Chinese artists for years and years to paint and draw those traditional pictures of mountains, lonely pine trees and wispy clouds that you see all over China, and in many Chinese restaurants all over the world. 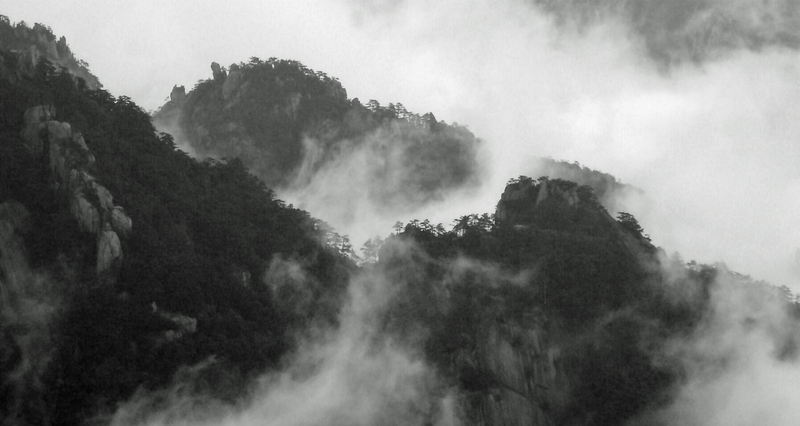 I guess most of those pictures were inspired by Huang Shan or Guilin. I tried two or three of black & white shots try to mimic those early ink drawings. To get the best from Huang Shan, you really need to stay for two or three days, that means staying for a couple of nights. Obviously, it would take ages to to go back down at night and climb again in the morning, so the resourceful Chinese have opened several hotels on the mountain peaks. 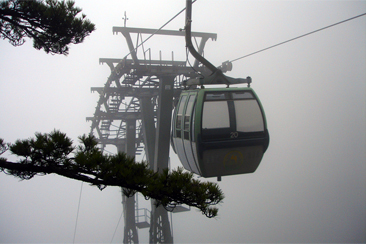 It is worth noting that the hotels, restaurants, and other facilities at the top of the mountain are serviced and kept stocked by porters who carry resources up the mountain on foot, hanging their cargo from long poles balanced over their shoulders or backs.